The University of California San Diego and its four student-run co-operatives have signed a new master space agreement to afford these organizations an opportunity to engage with the campus community, enhance the quality of student life, and provide unique cultural experiences. The agreement with Groundwork Books, the Food Co-op, the General Store Co-op and the Che Café Collective is the product of ongoing deliberation between these student organizations and campus leadership. As part of the agreement, the co-ops will be charged rent of only one dollar per year and receive free utilities and UC San Diego will make a significant investment in life and safety and other renovations on the Che Café facility in the coming months. All other co-ops on campus will be open through the summer and fall. 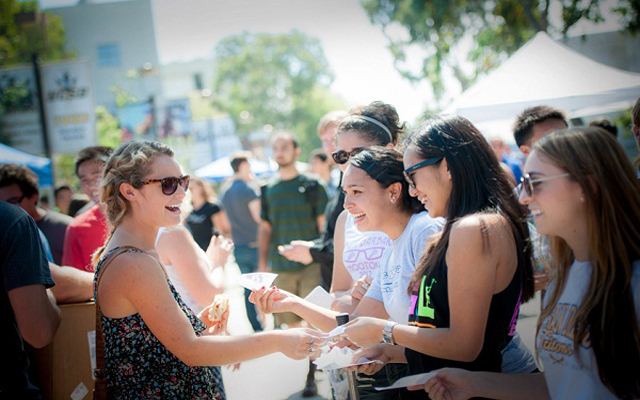 “The cooperatives extend their deepest gratitude to their supporters at UC San Diego and in the broader community, including volunteers, students, alumni and UC San Diego faculty and staff,” said Che Café core member Lane Barlow. According to Barlow, the co-ops encourage students as well as faculty, staff and alumni to not only patronize them but explore opportunities to volunteer and work. All four co-ops are accepting new member applications and provide training in many transferrable job skills. The Che Café is San Diego’s premier sober, safe, all-ages DIY music venue, where student, local, and touring bands perform several nights a week. Che Café also operates a vegan cafe and books its ballroom for meetings and workshops. For more information, please email thechecafe@gmail.com. Groundwork Books is a student-run bookstore which has provided UC San Diego students with progressive literature and low-priced textbooks for more than 30 years. Books for Prisoners, a program that provides donated books to those incarcerated by America’s prison industry, also operates out of the Groundwork space. For more information, please email groundworkbookscollective@gmail.com. The Food Cooperative is San Diego’s oldest organic vegan grocery store, promoting healthy plant-based diets to students, faculty and staff on the campus and innovating community-supported food distribution systems. For more information, please email food.cooperative@gmail.com. The General Store Co-op has long provided students with deals on food, supplies and other great products. The General Store currently operates as a worker’s cooperative, providing experiences to students in all aspects of running a thriving nonprofit business. For more information, please email generalstorecoop@gmail.com. At the University of California San Diego, we constantly push boundaries and challenge expectations. UC San Diego has been shaped by exceptional scholars who aren’t afraid to take risks and redefine conventional wisdom. Today, as one of the top 15 research universities in the world, we are driving innovation and change to advance society, propel economic growth and make our world a better place. Learn more at www.ucsd.edu.